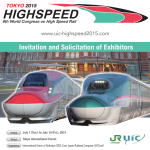 Tokyo, August 18, 2014 – Mitsubishi Heavy Industries, Ltd. (MHI), in cooperation with Mitsui & Co., Ltd., has received an order from the Concessionária Move São Paulo for the turnkey construction and delivery of the fully automated driverless system for São Paulo Metro Line 6-(Project). The Concessionária Move São Paulo is in charge of the construction and operation of the Project. This is MHI’s first railway systems in Latin America and expected to complete in 2020.